The new trailer for Destiny 2: Forsaken hints at a shocking story twist, but at least one player saw the whole thing coming days ago. Last night at Sony’s E3 press conference, Bungie debuted a brief story trailer for Destiny 2’s upcoming Forsaken expansion. The trailer indicated that a beloved character is going to die, and that a returning character from the first game would do the deed. Impressively, Redditor ArkConsular accurately predicted the whole thing last week, using used a combination of in-game item descriptions, lore knowledge, and old-fashioned deduction. The trailer, which you can watch here, may have only been a minute and a half long, but it landed hard on anyone who cares about Cayde-6. Memorably voiced by Firefly star Nathan Fillion, Cayde is one of the game’s most beloved characters. And soon, apparently, he’ll be dead. 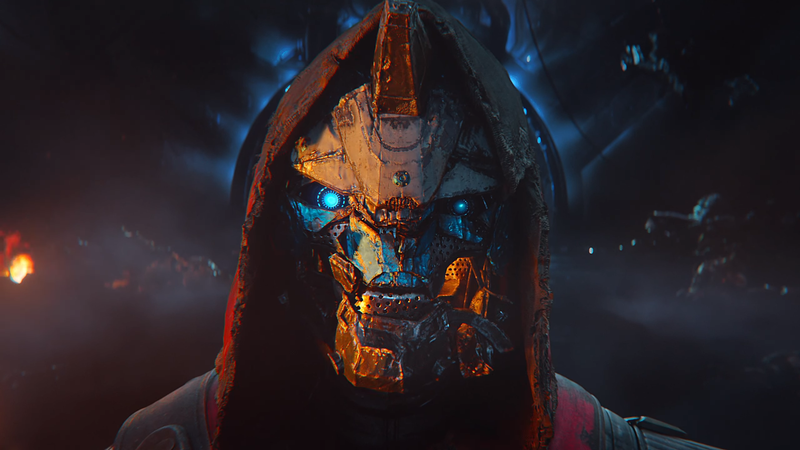 The trailer opens with a close-up of Cayde looking beat to hell, with his Ghost floating next to him… and then his Ghost is shot by someone off-camera. The camera rotates, and we see Fallen enemies closing in from all sides. Then we see the face of an Awoken with a gun in the camera’s face. Is he... could that be... he pulls the trigger, and the camera finishes its rotation with Cayde’s body on the ground. The villain takes off his hood and… yup, it’s Prince Uldren, the dickhead brother of the Awoken queen Mara Sov. (We haven’t seen Uldren since the first game’s 2015 Taken King DLC, though there have been clear hints that he survived the massive space battle that kicked off that expansion.) Uldren holsters Cayde’s own pistol, Ace of Spades, and walks away from Cayde’s body. End trailer. ArkConsular predicted all of that last Thursday. They predicted that Cayde was gonna buy the farm, that it would be a “real” death, that Uldren would be the one to do it, and that Cayde’s own gun would be involved. In a lengthy Reddit post, ArkConsular broke down their thinking. It starts about where most of us started when Bungie described Forsaken as having a darker tone, and a story about revenge. “Darker tone” is often code for “a character is going to die,” and as Agent Coulson knows, you can’t have a quest for vengeance without a heinous act to avenge. (That Agent Coulson eventually returned for Agents of SHIELD should also tell us something about the permanence, or lack thereof, of death in this kind of mass-market entertainment.) Last fall, dataminers uncovered voice lines about Cayde’s death in the PC version of the game, and since he was featured in the first Forsaken trailer, the prediction seemed more solid than ever. Few things can see the Light, but we are not blinded. The Bearer seeks the truth, but what separates truth from fiction is fragile. A pair of truths and a single falsehood upon the Bearer we shall impart. Brother, ally once more, sends his regards. Dreamer, awakened, the Bearer shall meet. Light fades, deep within the Prison. ArkConsular went on (fairly amazingly, in my opinion) to deduce that the “brother” line refers to Uldren, since he’s the best-known brother in Destiny. Since Uldren has never displayed any love of Guardians or our character’s Guardian, it seemed safe to guess that calling him an “ally once more” would be a lie. They also deduced that “Light fades, deep within the Prison” meant that a Guardian is going to die for real, out in the Awoken Reef near their Prison of Elders, too far from the Traveler to be resurrected. The game’s art was revealed to be Cayde’s hand cannon, Ace of Spades, with a ghostly image of him standing on the barrel. ArkConsular figured that meant Cayde would be the one to buy it. They even noted that the gun was being consumed by darkness in the image. Now that we know Prince Uldren has taken Ace of Spades, it’s a safe bet we’re gonna go wrest that thing from his dying hands. Hopefully at the end of a really good new raid. The rest of ArkConsular’s post goes on to make some guesses about what might happen in the aftermath of Cayde’s death. Lots of people have noted that since Cayde is an exo (a robot human, basically), he could die a “true” Guardian’s death yet still come back as Cayde-7. That does sound like one way this could go, and it also wouldn’t surprise me if when he does come back, he’s maybe voiced by a less expensive actor. Hopefully not, though. I do enjoy hearing Fillion’s voice over my headset every so often. As far as I’m concerned, it’s just fun to have some Destiny story stuff to chew on while waiting for the next expansion. The best hidden story in the first Destiny was the tale of Shin Malphur and Dredgen Yor, two Guardians whose vengeance-fueled showdown was chronicled in the hard-to-find corners of the text-only Grimoire. If Destiny 2 wants to take a similar story and put it front and center, I’m all in. As for ArkConsular, last night Bungie’s Eric Osbourne left a response to their initial prediction post: “seems pretty far fetched tbh.” Ha. Updated the article to note that last fall, dataminers uncovered some clues hinting that Cayde would die. Corrected a line that described Malphur and Yor as Hunters, as Malphur was a Hunter but Yor, whose true name was Rezyl Azzir, was a Titan.